I was wounded in action on April 1, 1969 while riding in the back of a “deuce.” We were on convoy when we were ambushed by the Viet Cong. My injury was due to an exploding mine. The enemy intent was to pin the convoy in, as they blew us up, as well as the last truck in the convoy. Ten Marines were killed in action. The ambush was on the road between Hill 52 and Hill 65 in Quang Nam Province. I spent from April 1 to December 16 in the hospital. I medically retired from the Marine Corps in February 1970. 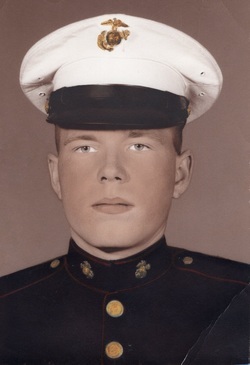 I permanently retired from the Marine Corps in November 1974. My family bought their brand new home on Hardwick Street in Lakewood in 1952. We watched it being built and moved in on August 8, 1952.